- The Wendy's web site still does not list the toys at all, but sometimes they mention the toys on their Facebook page. 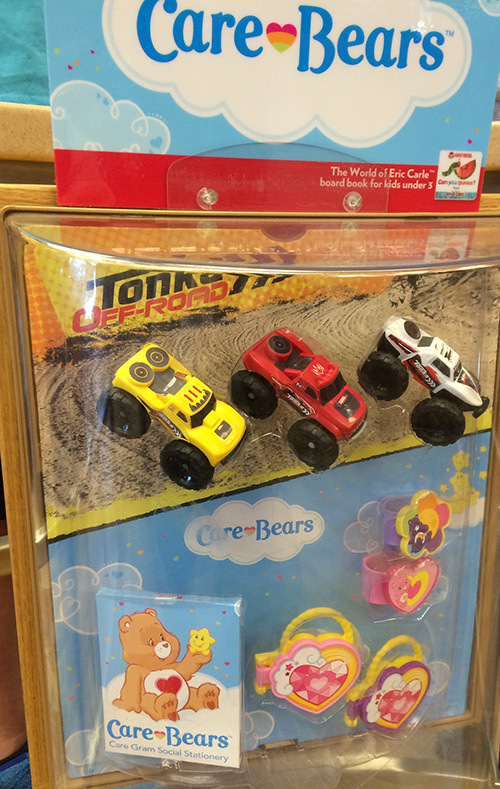 Currently they have a choice of Care Bears toys or Tonka trucks in their kids meals. The "kids under 3" toy is a board book by Eric Carle. - Sonic has Teen Titans Go! toys in their Wacky Pack meals. Don't miss the printable coloring page (that's a .pdf link). - Burger King has Rio 2 toys in their Kids Meals, with Tom and Jerry toys coming soon. - Carl's Jr. and Hardee's both now have X-Men: Days of Future Past toys and activities. There are four items shown on the Carl's Jr. site (none are specifically mentioned on the Hardee's site): a Beast figure, a Magneto figure, a ring, and collectible cards. Starting in early June, the promotion changes to Fruit Ninja.